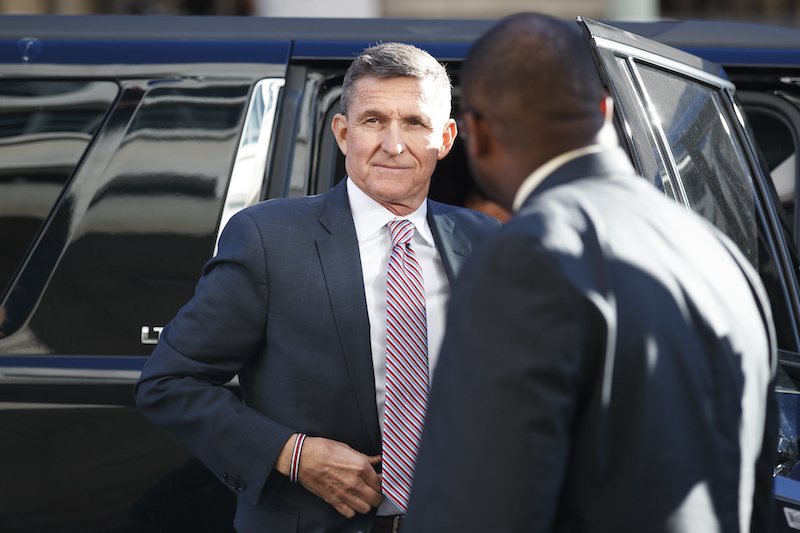 ALEXANDRIA, Va. (CN) – Gearing up for a summer trial, a federal judge cleared the way Friday for an indicted lobbyist to access records he says are being bogarted by convicted ex-national security adviser Michael Flynn. Bijan Kian, who served as vice chairman to the Flynn Intel Group consultancy, faces charges of acting as an unregistered foreign agent. He is charged in Virginia, unlike Flynn whose prosecution was spearheaded by special counsel Robert Mueller. Flynn pleaded guilty back in 2017, but the former general has not yet been sentenced because he continues to cooperate in Mueller’s investigation. Kian’s attorney Mark MacDougall argued in court today that this limbo period is hurting their ability to prepare for trial. “This entire process reeks of conflict,” said MacDougall of the firm Akin Gump. Kian issued two subpoenas in early March: one to Kristen Verderame, a lawyer who used to work at Flynn’s business, and the other to Covington Burling, the firm that represented Flynn in the Mueller prosecution. U.S. District Judge Anthony Trenga granted Kian’s motion to access the Flynn Intel Group files, in part, for now. He ordered attorneys to begin segregating the entire relevant client file and to provide Kian only with documents filed on or before the alleged violation of the Foreign Agent Registration Act. In his bid to access Covington’s entire file on Flynn Intel Group, Kian emphasized his role as the company’s second-in-command. But Covington attorney Dan Johnson emphasized Friday that Kian’s share of the Flynn Intel was smaller than Flynn’s. With less control, Kian would also have fewer rights to access company records, the lawyer added. Kian’s attorneys meanwhile shot back that the dissolution of Flynn Intel Group roughly two years ago means there is nothing left to protect. “We just want the same access as Mr. Flynn,” MacDougall said, noting that Flynn drew from a number of company files as he prepared his own defense. Johnson also argued that Flynn was CEO when he produced company files, and that the investigation of the company obligated such production. Noting that Flynn will also be a star witness during Kian’s trial this July, prosecutors also said that Kian’s fishing expedition is meant to impeach Flynn’s testimony. Kian has aggressively denied this suggestion, arguing that it is Flynn who wants to control the flow of information because Kian’s conviction would put Flynn in a stronger position to secure a lighter sentence. U.S. District Judge Anthony Trenga pointed out a slight wrinkle in the fight for access Friday. Flynn Intel Group was dissolved in Delaware, where state rules allow a company to preserve or restrict information on an entity for up to three years after it is formally dissolved. In rebuffing Kian’s requests, Verderame and Covington Burling have argued much of the material from Flynn Intel Group file is protected by attorney-client privilege or cannot be shared because it remains up for review in other ongoing investigations. In court Friday, the attorneys elaborated that these investigations were “congressional” in nature. The charges against Kian allege that he secretly lobbied the United States on behalf of the Turkish government to sway perception of Fethullah Gulen, a cleric accused by Turkish President Recep Erodgan of trying to overthrow his government in 2016. Gulen, who has lived in exile in the United States for years, denies that he was involved in the coup. The complaint against Kian says the trade group Inovo BV, which is controlled indirectly by the Turkish government, paid the Flynn Intel Group $600,000 to tarnish Gulen’s reputation in the United States so that it could secure his extradition. Turkish national Ekim Alptekin controlled Inovo and remains at large in Istanbul.